Formats: Xbox One (Reviewed). Also available on PC and PS4. Lots of zombies to shoot! 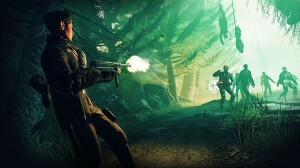 Zombie Army Trilogy is all about action. Take down Hitler and shoot tons of Nazi zombies in style! Who can argue with that? Those who have played any of the Sniper Elite games on the Xbox or PlayStation may immediately notice similarities between Zombie Army Trilogy and the Sniper Elite franchise. There is a very good reason! 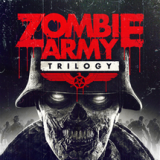 Zombie Army Trilogy comes to us from developer/publisher Rebellion, the folks behind the fun and gorily cinematic Sniper Elite series. Zombie Army Trilogy is a collection and conclusion to the 2013 Sniper Elite expansion games Nazi Zombie Army 1 and Nazi Zombie Army 2, which were previously only available on the PC. 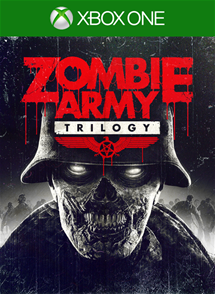 Zombie Army Trilogy features three campaigns and begins at the fall of the Nazi party during World War II. Rather than concede defeat, Adolf Hitler activates Project Z, which unleashes a zombie apocalypse across Europe. Like most horror movies, you should’t expect much of a story. Zombie Army Trilogy is all about action. You can play solo or cooperatively with up to four players online. Most of my experience was spent in solo mode, however there is nothing more exciting than taking down a horde of zombies online, especially with three of your friends. From the start, Zombie Army Trilogy lets you play the game how you want. Every campaign, every level, and every mode is available without having to play through the game to unlock them. For players who just want to jump into the action this is a very nice aspect. However, for somebody like me who likes to play through all or most of a game’s campaign first, to master the controls before taking it online, I felt the freedom of choice was a little like cheating. You can call me crazy. One of the interesting differences between Zombie Army Trilogy, and other modern FPS, is that it has an old-school feel to it. If you are old like me, you may remember those days of playing Doom or Quake. You’d work your way through a long hallway which emptied into an wide open space with an exit on the other side. You’d get this smile on your face, knowing that once you made it halfway in, you’d hear the demonic growling, and a split-second later you’re being swarmed from all sides by enemies. There are lots of moments like that in Zombie Army Trilogy, and they’re all pretty enjoyable. As thrilling as it is, you’ll eventually start noticing a pattern, which reveals the game’s repetitive nature. You’ll navigate through each level doing the same thing over and over: You’ll start off with many small zombie skirmishes, until you make it to a safe house. In that safe house is an entrance and and exit. Take a breather, and stock up on weapons and ammo. Once you step through the exit, you’ll need to be ready to deal with waves of zombie invaders, usually indicated by those vast, open courts. You’ll follow this pattern multiple times throughout each level. But being repitious, isn’t always a bad thing. It’s the feel of anticipation when watching a campy horror movie. When you’re standing in a safe house, knowing that once you leave, you’re going to be in for one helluva battle. It’s the perfect calm-before-the-storm moment. Another old-school element in Zombie Army Trilogy is the lengthy levels. While you can quickly jump into a co-op game with your friends, Zombie Army Trilogy is not a pick-up-and-put game. Expect to spend almost an hour playing through each level. This makes for a nice long playthrough, but it also makes it difficult to quit if you need to suddenly stop playing. I will admit that by the time I made it to the third safe house, I was ready for the level to be done. Having to abandon a level before completing it, and having to work back through it later, was a chore. Enemies come in a variety of different types. Aside from the traditional slow and lumbering zombie you’ll also deal other baddies like: suicide-bomber zombies who are strapped with explosives and run straight for you, reanimated skeletons, and zombies who know how to shoot back — including zombie snipers! 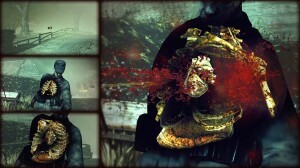 Much like the Sniper Elite series, whenever you take out a zombie, there’s a chance you’ll activate the stylish, but gory, cinematic kill shot, which follows the bullet path as it soars from your gun and pierces the undead flesh, sometimes even showing the bullet rip through bones, brain, and organs. I’ll admit that it wasn’t quite as satisfying as taking down a “real” (non-zombified) Nazi, like you can in the Sniper Elite games, but it’s still cool! Graphically, Zombie Army Trilogy feels like it exists somewhere between this generation’s and last generation’s visuals. It is by no means a bad-looking game, but don’t expect The Order: 1886′s or Forza Horizon 2′s level of detail. Control-wise the game played well. But when it came to some navigation elements, I noticed some inconsistencies. Especially when it came to determining which short obstacles could be vaulted over and which ones couldn’t. There is no jump button, but some objects can be vaulted over with a button press. In a few situations, I found myself trapped behind in a destroyed room, the walls were reduced to waist-high rubble. In other areas, I could jump over it when prompted. In this case, I couldn’t. It was like there was invisible wall — and I was brutally killed. One aspect that annoyed me about Zombie Army Trilogy, is something that is new to this generation of consoles: automatically captured video clips. The idea of capturing badass moments, and sharing them with your friends, is really cool. However, when there are too many of those moments, and a majority are automatically prompted by some in-game accomplishments, it can become a bit too much. Over the course of a single level, I triggered at least 6 video clips — sometimes almost back-to-back. These video clips are shared with your friends and followers in a collection of social activity. A large cluster of video clips can feel like that annoying friend on Facebook who publishes every activity they do on Facebook. While it may not be intentional, the automatic clips can be really annoying to your friends, and it doesn’t seem like you can turn them off — at least not easily. Not only that, but automatically captured clips can spam your collection with a lot of stuff that you may not really care to hold onto. Zombie Army Trilogy several modes. You can play through the game’s campaign levels alone, play cooperatively, but competively with your friends by seeing who can rack up the most kill points, or you can try and be the last-man-standing against endless waves of zombies. Would I recommend buying Zombie Army Trilogy? I think the answer really depends on how you enjoy your first-person shooters. If you’re not interested in story, are playing it mainly for the online co-op, and don’t mind some repetition when playing through the game’s levels, I think you’ll enjoy it. If you’re expecting a story-driven campaign or typically focus on the single-player aspect of FPS games, then I’d recommend you pass. Zombie Army Trilogy is currently only available as a digital download – at least that’s the case in the US. It requires approximately 10 GB of space on your hard drive. It was reviewed on Xbox One, but is also available on PC and PlayStation 4.